I have always said that excellent writing is the key to success in almost any subject. With a 9th grader in the house this year, we are focusing on writing, writing, and more writing. Initially, we are working on putting together all of the things we’ve studied up to this point: grammar, punctuation, spelling, capitalization, organization, and concision. Putting it all together into a written assignment can be overwhelming, so I came up with a self-editing writing checklist for my daughter to use. I was looking for a little more practice in writing mechanics when Time4Writing offered us a chance to try out their High School Writing Mechanics course. Right off the bat I was impressed with the intuitive user interface of the Time4Writing website as well as the clear instructions and expectations given to the student. We have used online courses before and have had mixed results with both the online interfaces and communication with teachers, so I was very pleased with this aspect of Time4Writing. 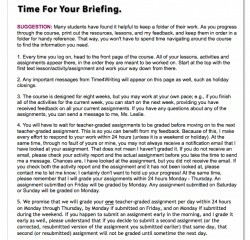 Before starting the course, students are directed to a “Briefing” page (this particular course is set up with a detective theme) where they are given the basics of how to navigate the course and submit assignments. Expectations are also set for when graded work will be returned (quickly!). 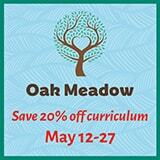 Each course is designed to last 8 weeks, but students can work ahead as they receive their graded assignments. For us, the 8 week duration of the course was just about perfect to keep the course interesting and prevent boredom. My daughter’s instructor, Ms. Leslie, was very responsive to my inquiries and always gave a quick turnaround on graded assignments. 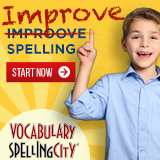 Instead of simply correcting the submissions, the instructor gave excellent feedback. She addressed my daughter by name and when needed would point out previous lessons that should be referenced for errors on material that had already been covered. Something that is a bit different about this course than other online courses that we have used is that the student receives feedback from the instructor before resubmitting the work for a grade. For students that are easily discouraged, this system is a great way to encourage excellence without the negative impact of low grades. The system could work against those who might tend to be lazy, however, because they would know that they have an opportunity to correct the work before it is graded (the feedback does not itemize the errors but is specific enough to give detailed guidance). This could lead to less effort on the initial submission. 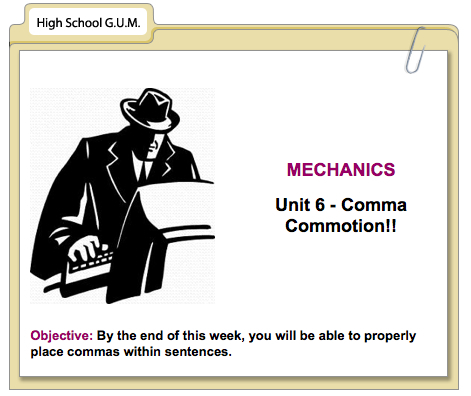 Unit 6 – Comma Commotion!! I thought this course was fun; it was much easier compared to the one I took last year. This course was simple and to the point. In this course, what made it easiest for me was that my teacher would reply back in 24 hours. My schedule is all over the place; therefore, having my schoolwork graded right away made getting homework done easy. I liked this course, and I would recommend it to anyone for a quick and easy way to learn proper use of grammar. Overall I was pleased with the course, and we are considering enrolling in the Paragraphs course to work on composition. To see more user feedback about Time4Writing or to contribute your own review, visit our Time4Writing Reviews page. To learn more about Time4Writing, visit their website at www.time4writing.com. Time4Writing provided the 8 week High School Mechanics course at no charge for review purposes.